Dear Dean Qian, members of the faculty and fellow students, good afternoon. 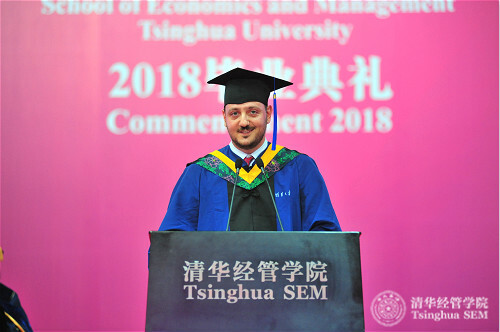 I am Giorgio Fortunato, a graduate of the Tsinghua-INSEAD Executive MBA programme Class of 2018. I am honored to be here today to address you at this graduation ceremony on behalf of my esteemed colleagues. I remember the day of the TIEMBA opening ceremony. I was excited to be here, I knew I had been given a tremendous opportunity to study in this prestigious institution and I anticipated learning from world-class professors and from my classmates to advance in my career path. But I could not realize at that time that this journey would offer much more than just short-term gains in career progression. I discovered my classmates were at different stages of their professional and personal lives. We had very different backgrounds, beliefs, and aspirations. Surely though we did have a something in common: the willingness to learn, and the desire to challenge ourselves with something new and unexplored. We were all in different ways in “search for our purpose”. First I want to share with you today my personal path in search for purpose and secondly I want to tell you how the TIEMBA programme has made an impact on our lives, making us stronger in our approach to challenges. First, through sharing my experience with my classmates, I had the opportunity to realize that the path towards leadership development is complex for everyone, and that every transition is painful. However, what keeps us going is the fact that we know we have to change to follow our aspirations and find our purpose, as professor Lee Rui Hua from Strategic Talent Management would put it “follow the shark”. I remember him telling us “Can you imagine spending your life doing something not aligned with your purpose? What an incredible waste!” TIEMBA taught us that through our choices we define who we are, we define our goals and our dreams, and when everything seems to be pitched against us and we feel frustrated, we must really treasure those feelings, because they make us react and invent new ways to change our future. Second, I realized that for many people there is only one choice: stay where you are, forget about your dreams and earn what you need now. So I feel particularly privileged for having the luxury of choice and I will protect it. In my path so far I was not alone, I had the support of my wife who has been beside me for the last 18 years, of my family who paid for my education, of my friends who challenged me and made me laugh, and now I feel even stronger as today our cohort becomes part of an incredible network of alumni. I want to close by wishing my classmates to keep searching for what they want to achieve in their life. And by achieving I don’t necessarily mean position, status, or material achievements. Searching for purpose can mean understanding where you are in your life, accepting who you are, or inspire others to overcome their difficulties. Purpose can mean renewing your relationship with family, or rediscovering love with your partner after drifting apart. Purpose sometimes is about taking a step back instead of a step forwards. But whatever it is – work hard for it – believe in it with all your imagination and don’t be afraid. One thing you should always keep in mind is that should you not find your luck and should the world not bend to help you, your classmates and the TIEMBA alumni will be here for that. Finally, on behalf of my Tiemba colleagues, I would like to express our gratitude to Tsinghua University, the School of Economics and Management, and especially Dean Qian, for the tremendous opportunity to study at this esteemed university – the dream of so many students. TIEMBA is a remarkable program and we look forward to welcoming many more graduates in the future.